With the release of the latest installment of EA Sports’ NHL franchise, NHL 19 promises to be one of the most exciting hockey games ever released. The early reviews on the game have indicated that this might be the best game in the history of the franchise. For the crowd that grew up in the 90’s, nothing will come close to NHL 94. However, this year’s version introduces some new modes, namely World of CHEL. You can read a full review of the game here by THW’s Drew Johnson. In the meantime, one of the most exciting things is the release of the player ratings. Throughout the summer in anticipation of the release, dozens of players were active on social media marketing the game and their own ratings. For the Edmonton Oilers, they get a nice little feather in their cap having the highest rated player in the game. Connor McDavid comes in with a 94 overall rating that’s closely rivaled by Sidney Crosby (93), Alexander Ovechkin (92), Drew Doughty (92), and Carey Price (92). McDavid and Crosby were both tied as the highest rated players in the game last year at 93 overall. 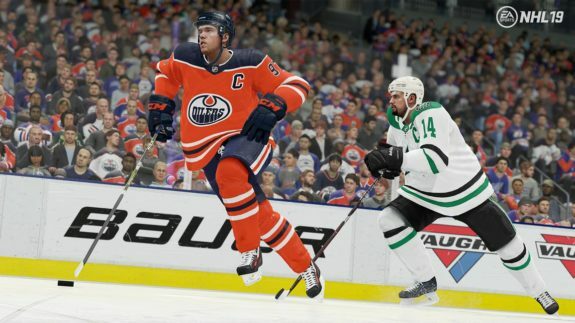 In terms of the NHL 19 edition, McDavid was the only player to crack the Top 50 players list in the game. That being said, it should be noted that Leon Draisaitl (87) did technically have the same rating as Jonathan Toews who ranked 50th on the list. It’s the same rating Draisaitl had in last year’s edition. Interestingly enough, there are several interesting ratings when you look at the Oilers roster, especially when you compare to last year’s edition. Key to Abbreviations: POS (Position), OVR (Overall), POT (Potential), PLT (Player Type), YL (Years Left), CONT (Contract), H (High), M (Medium), and L (Low). For the goalies, HYB (Hybrid Goalie), and BUT (Butterfly Goalie). For the defensemen, OFD (Offensive Defenseman), DFD (Defensive Defenseman), and TWD (Two-Way Defenseman). For the forwards, GRN (Grinder), PLY (Playmaker), TWF (Two-Way Forward), PWF (Power Forward), and SNP (Sniper). Cam Talbot saw his overall rating drop from 87 to 83 in comparison to last year’s edition. In comparison to the other starters in the Pacific Division, Talbot ranks 7th. The others ranked in order of their ratings are; Jonathan Quick (89), Marc-Andre Fleury (87), Martin Jones (87), Mike Smith (86), John Gibson (85), Antti Raanta (84), and Jacob Markstrom (82). Talbot’s rating is barely better than backups Ryan Miller (82), and Aaron Dell (81). Al Montoya (80) is pegged to be the Oilers No. 3 on their goalie chart, but the game isn’t reflective of his true status within the organization. Mikko Koskinen (78) is an unknown essentially after not being in the game for several editions. Although the Oilers are deeper in goal this year (Laurent Brossoit was rated 74 in NHL 18), it’s a mediocre goaltending group compared to other teams in the game. The top three defenders for the Oilers are once again Oscar Klefbom (84), Adam Larsson (83), and Andrej Sekera (82). However, you can add Darnell Nurse (82) to that group now. In this year’s edition, there aren’t any significant jumps in ratings on defense. Matt Benning (80) is just one point better than last year’s edition. Meanwhile, Kris Russell (79) returns with the same rating. You can see the rest of the defense ratings above. In this year’s edition versus last year, Ryan Nugent-Hopkins (84) and Milan Lucic (82) flipped spots with RNH now the third best Oilers forward in the game. There are still only five players rated 80 or better, which is one less than Edmonton had in NHL 18. There’s a lot of middling forwards that all rank between 77-79 overall. It’s quite reflective of the actual group Edmonton has. Are the ratings fair? I’d think so. So when you compare to what the real lineup might look like, there’s not a whole lot of surprises here. Kailer Yamamoto isn’t on the Edmonton roster, but if he makes the club out of training camp, he’ll likely be on the first roster update. If not, he’ll be with the AHL’s Bakersfield Condors. For those of you that have been reading my articles over the last month or so, you know what lines I believe the Oilers will run to start the year. Input those lines into a video game, and this is what they look like. The ratings in this year’s edition do a good job of separating the elite NHL players from the average ones. The Oilers have a lot of average to below average guys. All in all, there’s not a whole lot to complain about from a rating perspective. Would you wish Talbot was higher than 83 overall? Sure, but then again he is coming off a disastrous year so that rating is pretty fair. The ratings adjust slightly as the year goes on as it has over the last few editions, so what you see today might not be what you have in a few months. Either way, NHL 19 is a ton of fun, and for diehards of the series, it’s the best edition since NHL 94. For a more in-depth look at the ratings per team and division, there’s a ton of great breakdowns by THW Contributor Brandon Share-Cohen which you can find here on his author page. Now go and fix this mess and win a Stanley Cup in franchise mode, or fire up the all-new CHEL mode.